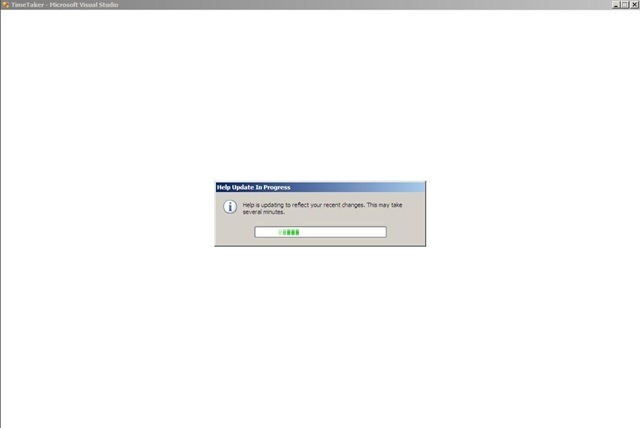 If you, like Mario (or me today), ever accidentally hit F1 in Visual Studio, and spent next couple of minutes looking at similar screen, I have a remedy. How often do you really use F1 to access Visual Studio help anyway? Wouldn’t it be good to just disable this shortcut? Well, as I learned today – you can do this. 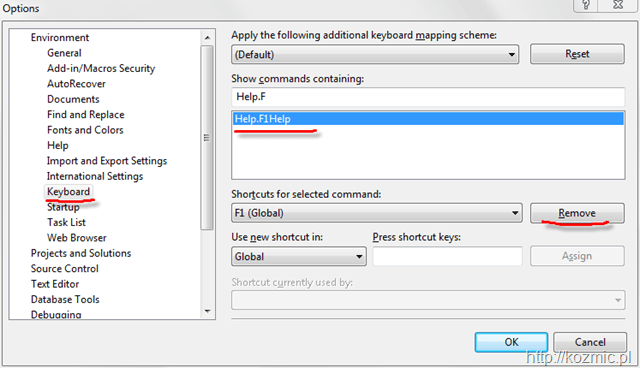 Go to Tools –> Options… navigate to the option above, find the command Help.F1Help and click Remove, et voilà! I upgraded to ReSharper 4.5 recently, and when working with it I discovered new, cool feature. And even if it’s not new, it’s still a nice little smart feature. … would also generate the constructor and property in one go. Today I learned about Launchy# – C# binding for Launchy extensibility API, that allows developers to write Launchy plugins in managed code. 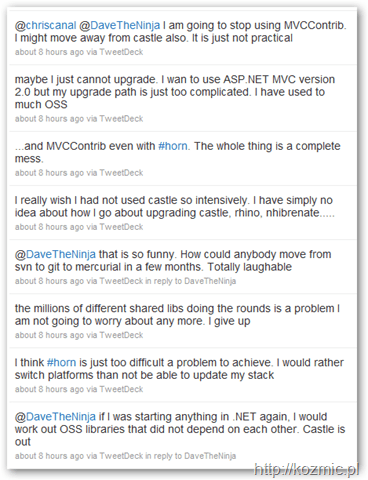 I once wrote… a hack more than extensions, that enabled users to tweet from Launchy. I was reluctant to extend it further, because then I’d have to write unmanaged code, which is far from my definition of fun. However, now I’m thinking about playing a little bit with Launchy# and building a proper Twitter-Launchy pluging (Twitty?). So now I’m gathering ideas. What would you like to see in Twitty? It looks like the name Twitty is already taken (I should have googled that first). So now I’m looking for ideas and name. I’ve been working a little bit with dynamic code generation at runtime (classes in Reflection.Emit namespace, collectively referred to as Reflection.Emit). 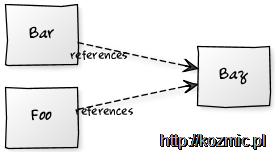 It’s a low level API, that requires you to work with IL operations, keep track of what is on the stack, and requires quite a bit of knowledge about IL and CLR. I’m no expert in IL, as probably most of developers, but there are ways to make this things easier. To work my way through generating code, I use iterative approach. 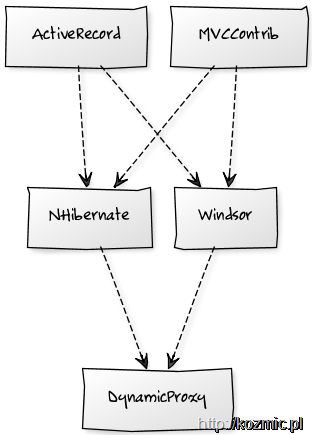 Write a class/method in C# that exactly (or as closely as possible) reassembles a single small part of what I want my dynamic method to look like. If my dynamic method is a static method – I write a static method. If it has a value type parameter, I write a method with value type parameter. I think you get the picture. The important thing is to really get as close to what you want to achieve with dynamic method as possible, and understand influence of those parts you can’t get exactly the same (for example because of C# limitations). I compile the class (also notice differences between mode you compile in – you usually want Release version, not Debug), and open it up in Reflector to see its IL. I write my code that does code generation, to generate IL identical to the one of my statically wrote method (taking into account all the variability). I save generated assembly, open it up in Reflector, and compare the IL, to the one created earlier, to see if they match. I often switch in Reflector to C# view, to better see some kinds of errors (passing wrong parameters, or calling method on wrong object). If you can’t save your generated code to physical assembly you can’t use this debugger visualizer to see its IL. If everything works, go back to step one, add another part of code and repeat until you have all you wanted. Here’s an example of this approach. It’s an actual code I wrote while working on DynamicProxy feature. The thing that is different here, is that Castle has an additional layer of abstraction on top of Reflection.Emit so I was not working directly with IL. This makes things a little bit easier, because you’re operating on a higher level of abstraction. On the other hand however, you don’t get that tight control over what gets generated, and you have a new API to learn. Anyway, I actually already had a pretty good idea of what I wanted to do (I only needed to change the way things worked, by calling other constructor in my dynamic method, passing additional parameters). I wrote some tests to verify that my code works the way I wanted it to, and I implemented it. Unfortunately one test didn’t pass with the following error. One parameter I wanted to pass was an array, passed by reference, and it seemed that there was something wrong with it. I opened Reflector and peeked into the generated method. Everything looked just fine when I switched to C# view. To investigate things further I saved IL of generated method to a file, and I did the same with IL of C# method I wrote as an example of what I wanted to accomplish. I then opened them both up in a diff tool to see where the difference was. As it turns out, the code below (generated.txt) passes the loads the field value (ldfld) while it should load its address (ldflda). Knowing this it was trivial to fix my code. On a side note, there’s also a Reflection.Emit Language plug-in for Reflector that may be useful to you if you’re working directly with Reflection.Emit classes. 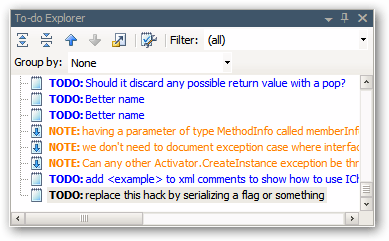 It shows you for any method you select the C# code that you’d write to generate that method with Reflection.Emit. Creating multilingual applications is a huge topic. There are whole books devoted to it, and if you’re serious about it, you should definitely read those, because what you see on surface, is only the tip of an iceberg. If you only want to play with localization or need a quick reference, hopefully this post will help. 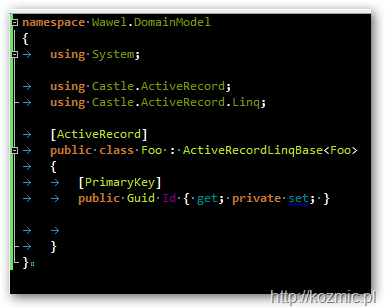 Second thing is, localization mechanism in .NET is greatly based on conventions, and it’s what we’ll focus here. First obvious rule is, that each string, picture, video… generally speaking localizable resource must not be hardcoded. If you don’t hardcode resources where do you keep them? In (surprise) Resources file. Generally you can use .resx files, or plain .txt, though the latter are useful only if you only keep strings. 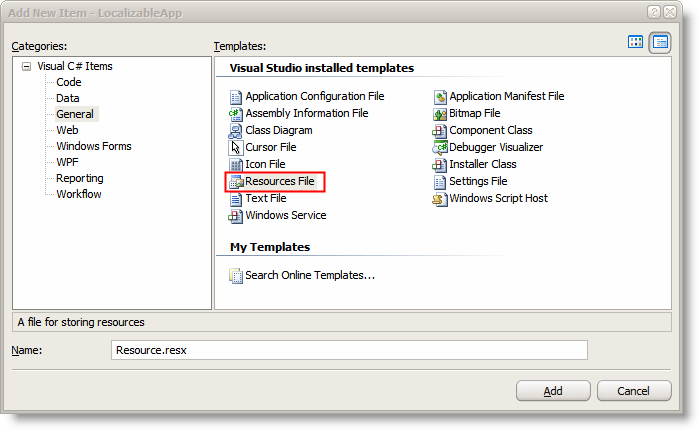 Visual Studio has pretty good support for editing resources in .resx files, and later I’ll show you another tool that can do it as well. 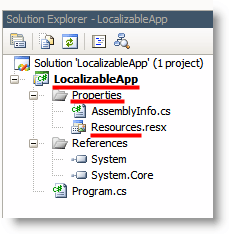 If the Visual Studio project is named LocalizableApp, and the .resx file we want to use is in folder Properties, and the file itself is named Resources.resx, the whole base name for the resources is “LocalizableApp.Properties.Resources”. That’s where the compiled .resx file (.resources) will be located within the assembly. 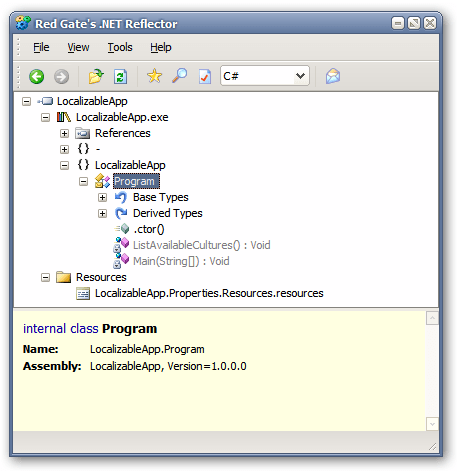 You can see it, if you open the compiled assembly with Reflector. The CultureInfo object held in CurrentUICulture property of currently executing thread will be used. The default value for this property is the same as language version of Windows OS the program is executing on, which is reasonable. If your user uses Polish Windows she will probably want to interact with Polish version of your app as well. Of course you wouldn’t hardcode the culture the way I did in the example, because it would defeat the purpose of using culture in the first place. OK, so how to add another language? You have the .resx file with the default, fallback resources, right? So now all you need is either send the file to a localization company, sit back and enjoy life, waiting for them to do the hard job, or do it yourself. 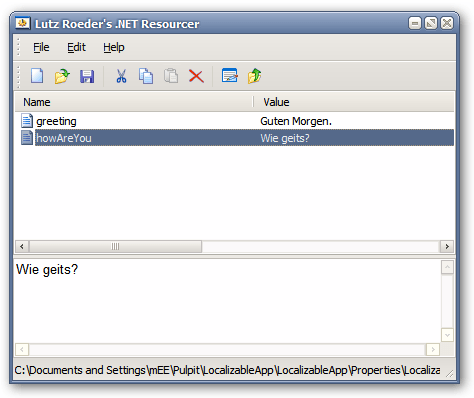 To go with the latter option, you may want to use a tool to edit resource files, called Resourcer, by Lutz Roeder (Reflector, people!). It is important to obey this pattern, as by convention, this is what ResourceManager expects. If you fail to obey it, ResourceManager will not be able to pick your translated resources and will fall back to the default. Having translated and properly named .resource file we need to make a satellite assembly out of it. 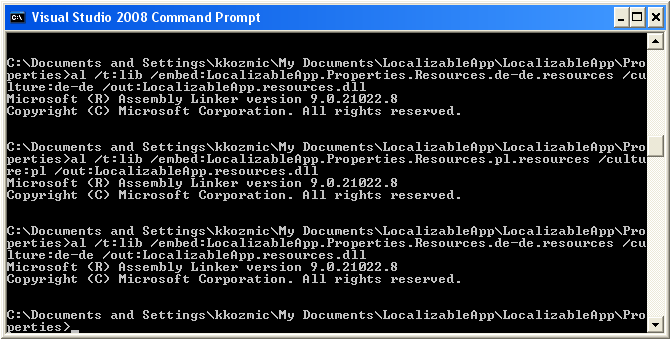 To do it, you need Assembly Linker (al.exe) tool that is part of .NET SDK. Notice that the name of the assembly is the same for every culture. So how do we deal with that. Obviously we can’t have two files with the same name in one folder. The way it is handled, is through subfolders. Each satellite assembly is held in a folder which is named after the culture of the satellite assembly. For example if our LocalizableApp.exe is held in a folder, let’s say Debug like on the above screenshot, the de-de satellite assembly would be Debug\de-de\LocalizableApp.resources.dll and for instance pl assembly would be in Debug\pl\LocalizableApp.resources.dll. I hope this is all clear by now. The greatest thing is, to add new language you don’t even need the actual base assembly. All you need is its resources and their location within the assembly. I don’t like the Unity Inversion of Control framework. I find it too verbose, requiring user to be too explicit (except for cases where it doesn’t while it should), not intuitive and I generally don’t like its design. Unfortunately, it’s the only IoC framework I’m allowed to used at work, so I’m stuck with it, good or bad. There are times however that I’m just astonished by how it works, and mostly, in a negative sense. There’s an important principle in computer science, called Principle of the Least Surprise, that says, that framework (in particular) should have its API designed in such a way that it works like the user (programmer in this case) would expect it to. Let’s take… well, I don’t know… Unity for example. Everything seems pretty obvious here, to anyone who has ever used an IoC container. 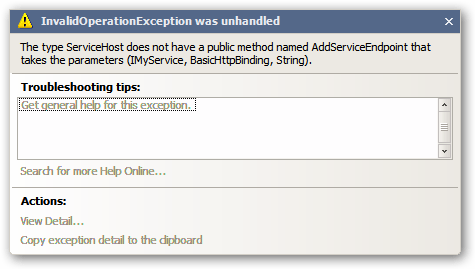 Using generic parameter I register a type (ServiceHost) service, with specific key (myService), then I explicitly (I could write a whole post about how not good idea it is, but it’s leave it out for now) specify constructor I want used and it’s parameters using InjectionConstructor, next I specify method injection with InjectionMethod class. Pretty simple, huh?